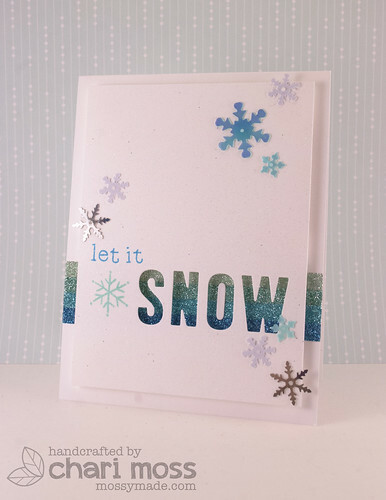 MossyMade: Let it Snow....some Glitter! Hello! Today I have two more projects using Lawn Fawn and thermoweb products. I also have a video over on the Lawn Fawn Blog so be sure to stop over there and check it out. Here are my clean and simple and super sparkly cards for today! Check out the video on how I made these on the Lawn Fawn Blog or on the Lawn Fawn YouTube Channel. Also be sure to check out the Lawn Fawn blog and Thermoweb for more projects all week long. these cards really are stunning and sparkly and amazing! they're both gorgrous!!! i love the addition of the snowflake sequins (happy accident!!) and your video on the lawn fawn blog is awesome, as usual!!! You can never have enough glitter and these cards are gorgeous!! 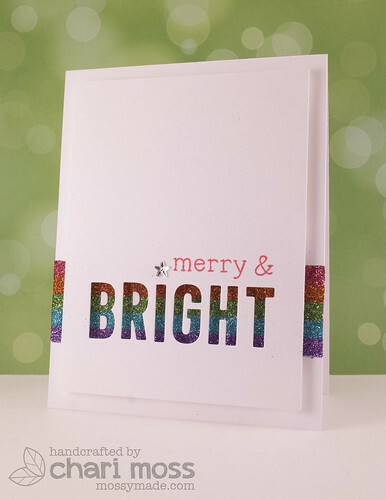 Love the colours you used and that the rest of the card was left as white, very clever! Oh these cards are stunning Chari!!!! TFS! what brand of tape did you use? can you buy it at michaels? card looks awesome!